grated peel from ½-1 orange. Prepare the spring form. Put baking paper at the bottom. The cake is a bit fragile when baked, so the paper helps when removing it from the spring form. Melt butter and chocolate at low temperature or in a water bath. It's easiest if you chop the chocolate first. Whip the egg whites with less than half the sugar. Grate the orange. Chop it if necessary as finely as possible. Whip the egg yolks until they are light and airy with the remaining sugar. Add the melted chocolate mixture slowly into the egg yolks. Put about 1/3 of the egg and chocolate mixture into the egg whites. Mix them well. Pour it all back into the remaining egg whites and fold it to a uniform color. Not so hard that the air is whipped out of the dough. Put 1/2 to 2/3 of the chocolate mousse batter into the spring form. Bake it at 350°F (175°C) for approx. 30 min. Keep the remaining mousse at a cold place. The refrigerator or on a cold winter terrace (not too freezing). When the cake base is done, let it cool down. It does not have to be all the way to room temperature. Finger warm is ok. 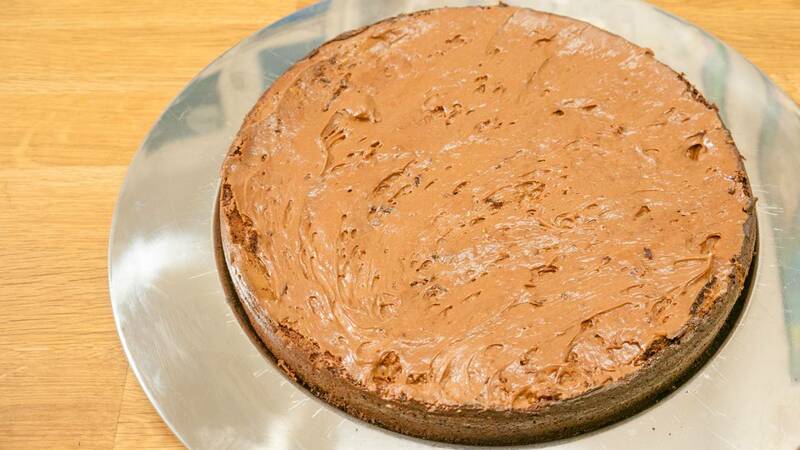 Spread the remaining chocolate mousse on top of the base. 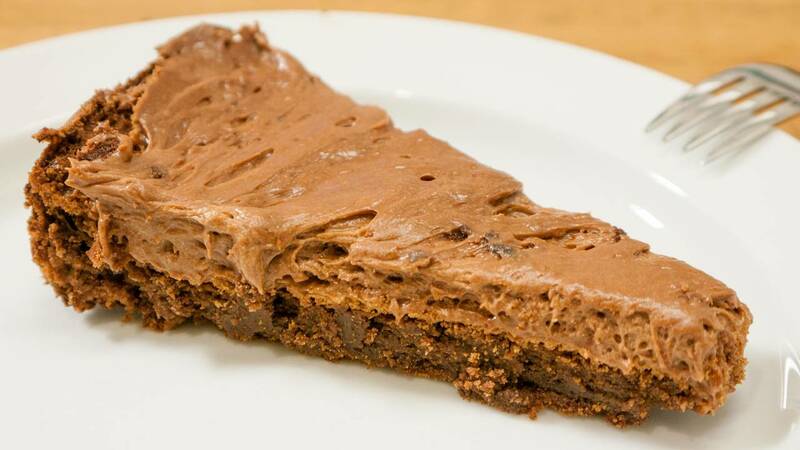 If you like, you can sprinkle some cocoa powder on top for a darker taste and nice looks. If you whip whites before the yolks you do not need to wash the whipper. If egg yolks gets into the whites they can not be whipped, so the whipper should be thoroughly washed. In the video, I whip the yolks first. I don't usually do that. I do not know what I was thinking about. 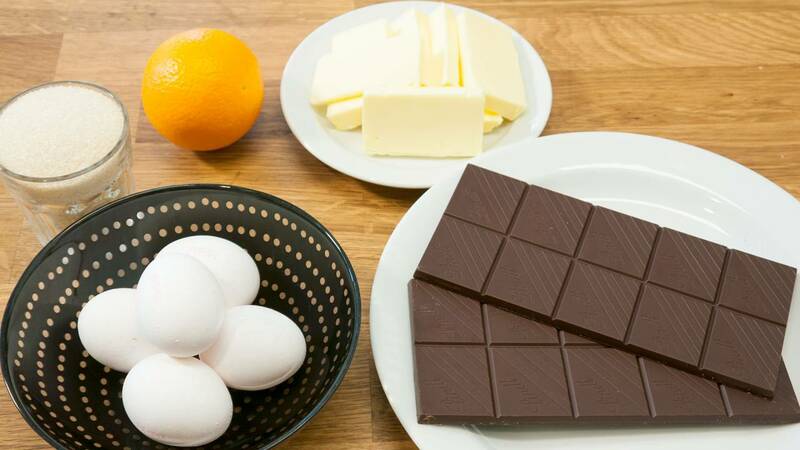 Make sure that the melted chocolate is not much more than lukewarm when it is mixed into the egg yolks. Otherwise you risk making scrambled eggs.